There are no simple definitions of systems and systems thinking (Monat & Gannon 2015) that are sufficiently rich to clarify what they are essentially about. So instead, I will offer a circumscriptive definition in three parts and add a small concept map to go with it. This post has been syndicated by The Systems Community of Inquiry to https://stream.syscoi.com, the global network of systems thinkers, scientists and practitioners. Open systems … consist of sets of at least two parts, elements, components or subsystems that are characterized by at least one interrelationship. The distinction between an open system and its environment is conceptualized by the system boundary. Open systems interact with their environment by receiving input and generating output. 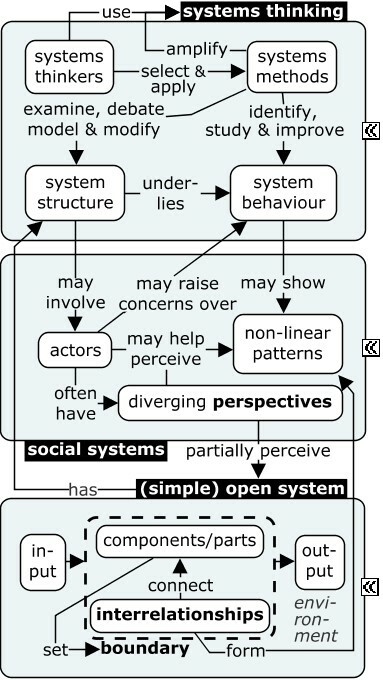 Social systems ….are open systems involving human actors (in roles as client/beneficiary, decision-maker, planner, see my ‘Concept map of Churchman’s categorical scheme for the inquiring system of a dialectical systems approach‘), who often have diverging, partially perceptive perspectives, which – in combination – may help them perceive non-linear systems behavior more fully. All humans are capable of systems thinking to varying degrees. Systems methods can amplify more mundane forms of systems thinking. 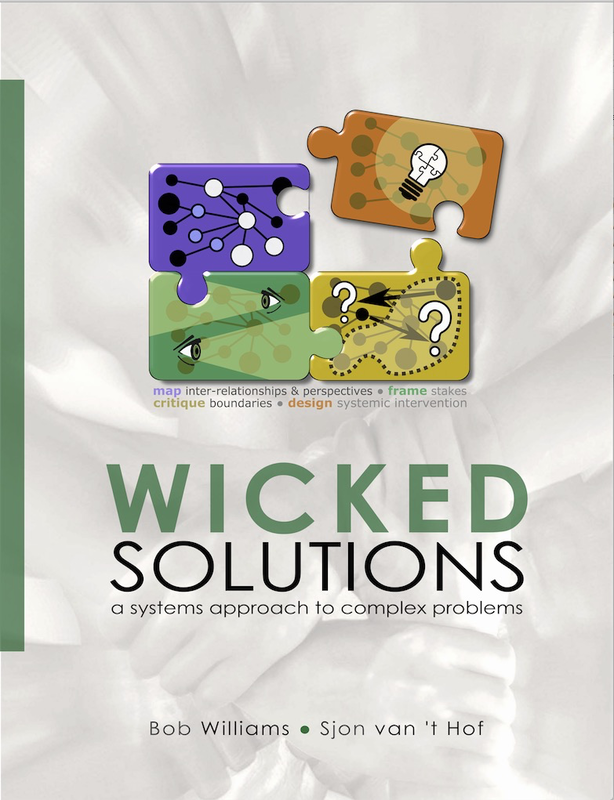 Non-linear patterns … are what need to be changed in the case of (wicked) problems. These patterns are formed by inter-relationships connecting the various parts or subsystems. A well-known set of non-linear patterns is formed by Senge’s (or Kim’s) systems archetypes. In social systems these inter-relationships are intricately linked to the values of the actors involved. Aspects defining the problem situation include processes, world views, purposes, uncertainties, conflicts, and motivations. Some of the aspects are qualitative rather than quantitative. Key operational concepts …. are inter-relationships, perspectives, and boundaries. Inter-relationships and perspectives need to be mapped. Different perspectives must be combined to map them properly. Once a sufficiently comprehensive map is available the boundary of the system can be debated to rank inter-relationships and perspectives in terms of relevance with a view to understanding and changing the non-linear patterns. A simple method for learning how to handle inter-relationships, perspectives, and boundaries can be found in Wicked Solutions. You can support my work (of writing an even more convincing sequel, of which this post is a part) by buying Wicked Solutions at Amazon.com. You will support me even more if you buy at Lulu’s. There is also a PDF at Gumroad for only $12. Your thinking will never be the same.